For the homeless and the needy, Karunamaya is an abode that welcomes them with open arms. Karunamaya Ashram in Marnamikatte has completed four fruitful years of serving the destitute. The Karunamaya team’s selfless service in looking after the underprivileged and enabling improvement in their health condition-this is truly commendable. Not many serve society in such a noble manner, only a few have the heart and mind to do so. Karunamaya Ashram which is located at Shervin compound, Marnamikatte houses 25 beds and more than 70 people have convalesced here in the past 4 years. Many of them have returned home after being appropriately rehabilitated. Due to space limitations here, another Ashram with 50 beds has been prepared in Permanki, Ulayibettu, thanks to the generosity of Mr.Antony D’Souza and siblings who have donated their ancestral home for this noble cause. 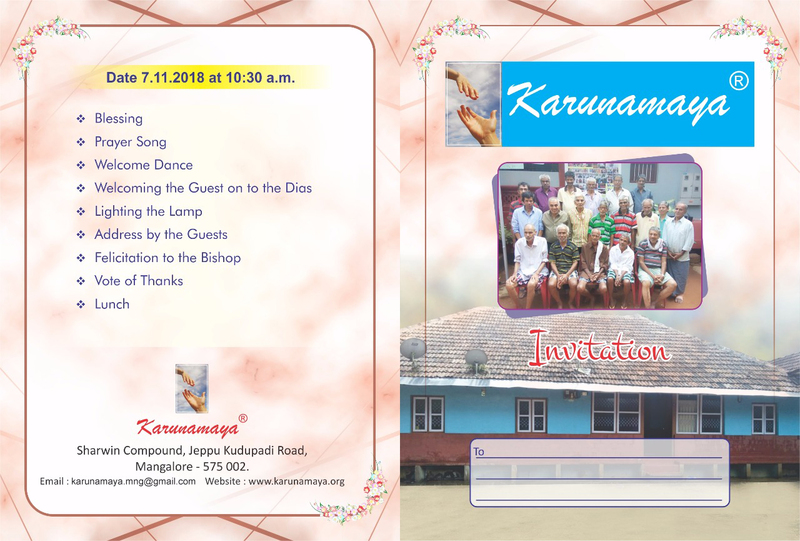 Today, on 7th November 2018, the new Bishop of Mangalore Diocese, Most.Rt.Rev.Dr.Peter Paul Saldanha will inaugurate and bless this new Ashram. There will be several dignitaries present during the inauguration: Mr.U.T.Khadar (Karnataka State Minister for Urban Development and Housing), Dr. Y. Bharath Shetty (MLA of Mangalore North Constituency), Rev.Fr.Louis Cutinha (Parish Priest of Permanki Church), Rev.Fr.Victor Machado (Parish Priest of Kulshekar Church), Mr.J.R.Lobo (Ex-MLA of Mangalore South Constituency), Mr.Vasanth Kumar (President of Ulaibettu Gram Panchayat, Mr.Walter Nandalike of Daijiworld, Mr.Anil Lobo (President of MCC bank). 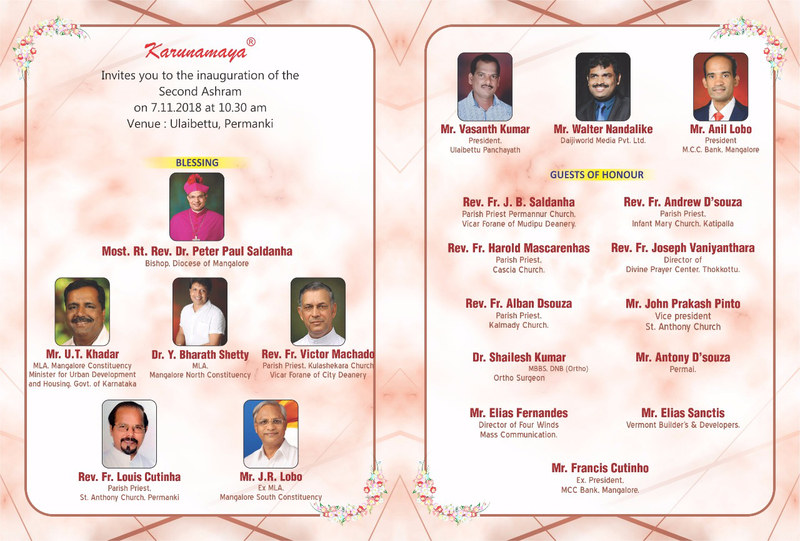 The guests of Honour for the inaugural function are Dr Shailesh Kumar, Orthopaedic Surgeon, Rev.Fr.J.B.Saldanha (Parish Priest of Permannur Church), Rev.Fr.Andrew D’Souza (Parish Priest of Infant Mary Church Katipalla), Rev.Fr.Harold Mascarenhas (Parish Priest of Cascia Church), Rev.Fr.Joseph Vaniyanthara (Director of Divine Prayer Centre in Thokkottu), Rev.Fr.Alban D’Souza (Parish Priest of Kalmady Church), Mr.John Prakash Pinto (Vice-Precident of St.Antony Church), Mr.Antony D’Souza from Permal, Mr.Elias Fernandes (Director of Four Winds Mass Communication), Mr.Elias Sanctis of Vermont Builders & Developers and Mr.Francis Cutinho (Ex-Precident of MCC Bank). May God Our Loving Father shower his choicest blessings on this new Ashram. May his mercy and grace abound in this place that will serve the needy and the homeless forever.